COURTENAY, B.C. – Following a string of apparent cat disappearances in the Comox Valley, a young boy has been reunited with his furry friend. Bryan Baker, President of the Kitty Cat Prevent-A-Litter-Society (Kitty Cat P.A.L.S), said the cat, named Carlos, was discovered in a “heavily wooded rural area” after going missing for about two months. “Two months ago, we were in touch with a mother whose family cat had gone missing and she wanted tips on how to get her cat back,” he said. Baker said the fear was that the cat had been trapped and dumped in a wooded area of the Valley, which is something that had happened with other cats in the past. “We didn’t mention it to the family as the cat was used as a therapy cat for a young boy that is ill, so we didn’t want to stress out the family thinking that this cat was never coming back,” he explained. Today, this story came to a happy conclusion, as Carlos was reunited with his family. “We’ve had Carlos in our family for seven years and he’s always been such an amazing animal. He’s more than an animal, he’s a family member,” said Deb Wilson. She said Carlos would walk her son, Josh, to the bus stop every day before his disappearance, and losing the cat was devastating for the family and the young man. Wilson said today was a day filled with mixed emotions. “I’m absolutely elated that my baby is alive. I’m so saddened that this has happened, I’m angry and I’m concerned that there’s people that live in my neighborhood that would actually do something like this,” she said. “I can’t imagine that someone would take the time to trap a cat – don’t bother with the SPCA, don’t bother dropping him off at the vet or whatever, but what take the time to drop him off far away, and leave him there knowing that he’s going to die a horrible death.” Fortunately, Carlos’ story saw a positive finale. “If there’s a cat that’s in your neighborhood that you don’t like, that’s in your garden, that’s jumping on your car, or whatever, call the SPCA, call the Kitty Cat P.A.L.S, call a vet office, call anyone. Just don’t injure an animal, there’s other ways to deal with it,” Wilson added. Earlier this summer, another Valley resident, Maria Martin’s cat was stolen from her property in the Puntledge area of Courtenay. 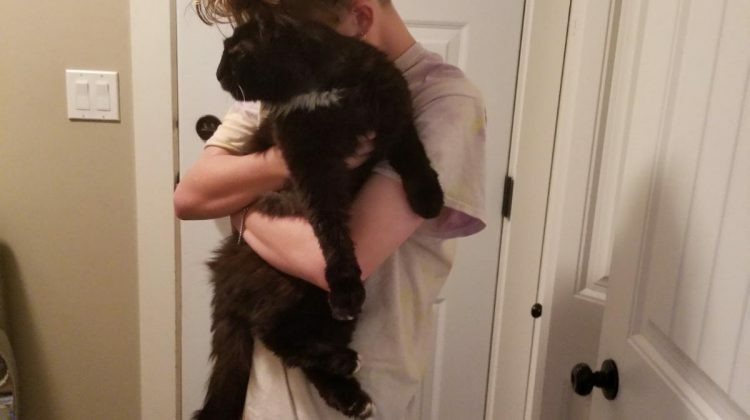 “We found that his body was found hit by a car by Mount Washington, in the Dove Creek area, which we later found out is a very popular ‘dumping ground’ where other cats had been found that had been trapped by other people,” she said. Martin said efforts have been made to find the person or persons trapping the cats, but so far a culprit has not been found. “We plan on working together as a team and putting out traps to hopefully find other cats that have been dumped in these popular locations, and either getting them medical attention or reuniting them with their owners,” she said. Martin said the act of trapping is technically legal, but what is being done after the cats are trapped is illegal and not right. “I’ve heard quite a few instances of cats being trapped and dumped. Kitty Cat P.A.L.S has mentioned that they have rescued cats that have been dumped in these locations after many years of going missing,” she added. Baker noted that Martin’s story assisted in the search for Carlos. “This lead the family to think the same thing had happened to their cat, because they had a feeling that something out of the ordinary had happened,” he said. Baker noted that Kitty Cat P.A.L.S then notified the family about the reported cat dumpings, and told them they would do everything they could to help the family find Carlos. “Our volunteers, they were in a very remote wooded area and were driving, and saw a cat in a place where you never see a cat, other than perhaps maybe a cougar. That’s the only wildlife that should be out there,” he said. Carlos’ family was contacted and the young boy was reunited with his friend. Baker said many tears were shed during the reunion. Anyone with further information on the cat trappings and dumpings is asked to contact Kitty Cat P.A.L.S, the SPCA or the RCMP. 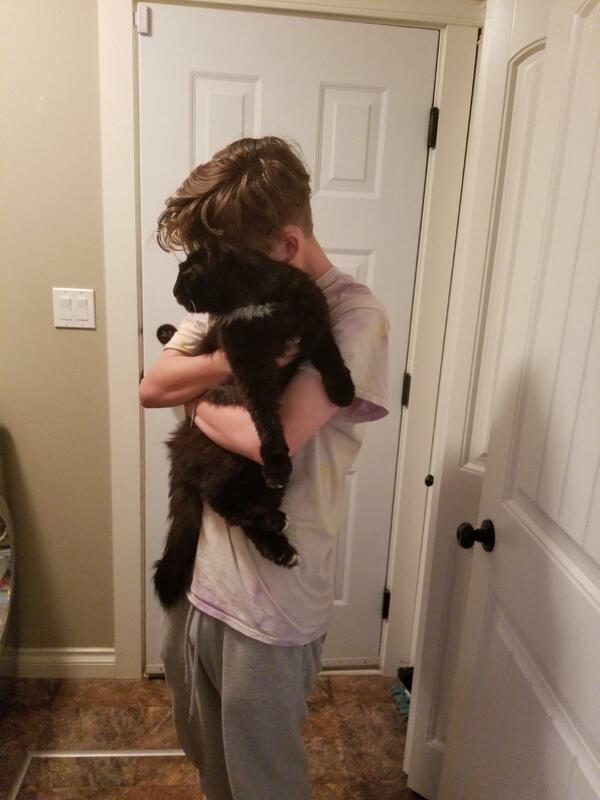 Photo caption: Deb Wilson’s son Josh is reunited with his cat Carlos on August 8, 2018. Photo courtesy Deb Wilson. Gearing up for Paddle Fest!